Are you a lifelong learner? Some great tips for kids of ALL ages. One of the most valuable things you can ever attain in your life doesn't have a dollar value: it's knowledge. Whether you head to college, learn on the job, or just make a hobby out of exploring new and exciting topics, learning is one of the best things you can ever do for yourself, personally, professionally, or otherwise. So, why not learn to do it better? We've collected some amazing tips and tricks (an update of our earlier article, almost seven years old now) you can use to help you get the most out of the time you spend learning. From study suggestions to brain hacks, these tips will help you learn faster, deeper, and better, no matter the subject. Eat breakfast. Studies have shown that skipping breakfast can impair your ability to learn, making you slower to recall memories, poorer at math, and overall cognitively less adept. So, to learn better, eat a hearty breakfast in the morning, especially if you're taking a test or heading to class. Get enough sleep. Whether you get enough sleep can have a huge impact on how well you're able to learn. Researchers have found that not getting enough sleep impairs the brain's ability to remember new information. It can also make it harder for you to concentrate or be creative, and reduce your overall cognitive function. A solid six to eight hours a night is a must for maximum learning potential. Exercise. Exercise doesn't just keep your body fit; it also helps your mind stay in great shape. Aerobic fitness has a positive effect on cognitive function, improving learning ability in both humans and animals. Researchers have found that even just 20 minutes of exercise can increase information processing and memory functions, so consider integrating workout sessions into your academic life. Take supplements. Gingko biloba has long been promoted as an herbal treatment for improving cognitive function. While scientists have yet to prove whether it truly has a marked effect on learning and memory, it can't hurt to give it a try if you want to max out your learning potential. Don't ignore health issues. Many health issues like uncorrected vision and depression can affect how well you're able to learn. If you have a health issue that may impact cognitive function or distract you from learning, then see a doctor who can help you treat the issue so you can focus on your studies instead. Have a laugh. Take a break from learning to have a good laugh. Laughing can help to make you more relaxed and more receptive to the ideas or information you're trying to learn. What's more, it can also help to reduce the anxiety associated with certain assignments or subjects, so learners can relax and let go of preconceived fears. Focus on your passions. If you're interested in something, you're much more likely to seek out additional material on it, study it, concentrate on it, and generally learn a whole lot more about it. Even if a topic isn't a favorite, find a way to relate it to something you do love to get more out of learning it. Train your brain. Just as you can train your muscles, you can train your brain. If you want to break out of bad habits or mental patterns, slowly work on them. 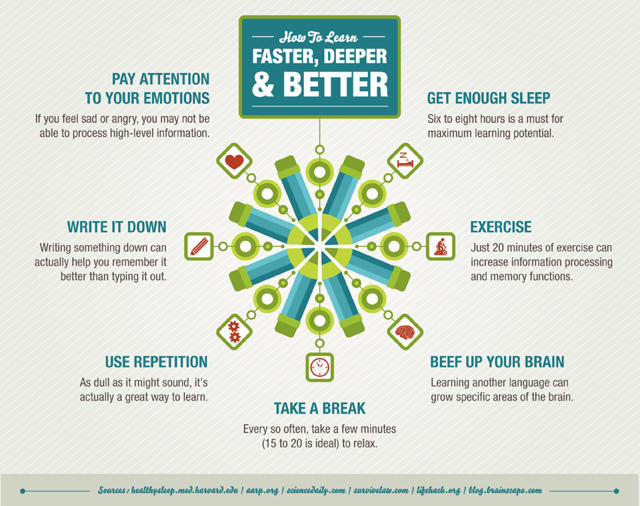 In time, you'll be able to improve focus and concentration and have a better behaved brain. Pay attention to your emotions. If you're feeling sad or angry, you might not be able to process high-level information, at least that's what research suggests. Studies have found that certain types of strong emotions shut down the brain's higher-level mental processes, which could be a real roadblock to learning. Capitalize on spike time-dependent plasticity. A learning model called spike time-dependent plasticity can help you take advantage of natural phenomena in the brain to learn more. The model helps learners capitalize on neuronal avalanches, or brief bursts of activity in a group of interconnected neurons that create an "avalanche" of brain stimulation. Try twilight learning. Twilight learning, perhaps better known in popular culture as subliminal learning, has long been a method employed for training the brain. If you're trying to learn how to do something (or not to do something) or implant information into your brain, use the suggestive messages of this method to help you get there. Try osmosis. If you've ever wished you could just put a book against your head and have the information migrate into your brain, you'll appreciate knowing that there are ways you can use osmosis to learn. Stimulation during sleep has been found to enhance skill learning as associations formed during sleep remain intact when you wake up. While it's not the same as gleaning knowledge through contact, learning something new can be as easy as sleeping with an educational track playing so you can hear it. Embrace the learning methods of The Matrix. The effortless learning showcased in the film The Matrix may not be science fiction entirely, at least according to recent research. It may be both possible and plausible to use technology to learn to do things like play the piano or hit a ball with very little conscious effort. How? By using images processed by the visual cortex to alter brain patterns so that they match those of someone who already knows how to do the activity. It's not a practice that's widely available yet, but even low-tech learners can practice getting into the mindset of experts when learning. To really get the most out of any kind of learning, whether you're taking a dance class or trying to learn calculus, you have to have focus. These tips can help you build it, keep it, and become a concentration whiz. Take a break. It is very difficult to maintain intense concentration when learning something for an extended period of time. In fact, research has shown that you'll actually learn and retain more if you punctuate your studying with short breaks. Breaks give your mind time to relax and absorb information, but don't stay away for too long: 15 to 20 minutes is ideal. Get outside. Can't focus? A short hike or walk outside could be just what you need to clear your mind, reduce stress, and get you ready to focus on the task at hand. Alternate subjects. If you don't have time for a break, give your mind a change of scenery in a more figurative sense instead. Leave one subject aside for a moment to concentrate on another. You'll have the best results if you alternate between subjects that require different kinds of thinking. Don't multitask. While you might think you're getting more done when you're multitasking, you're actually just shortchanging everything you're working on by dividing up your attention. Instead, focus on one topic at a time. It might take longer, but you'll get more out of the experience. Block out distractions. Distractions can have a serious impact on your ability to focus and in turn to learn, perhaps much more than you realize. Even simple things like answering text messages while studying can leave you with poorer learning outcomes, so turn off your phone, disconnect from Facebook, and block out noise when you're learning. Practice smart time management. When you don't manage your time well you end up stressed, rushed, and very often overwhelmed. The solution? Be smart about how much time your learning endeavors will take and prioritize them over other things. If you wait until the last minute you're less likely to remember information and will learn a whole lot less than if you plan ahead. Have caffeine in moderation. For some people, caffeine can be a valuable tool in boosting concentration and focus. Have a small amount of coffee, tea, chocolate, or other food containing caffeine before you study, but don't overdo it; too much caffeine will leave you jittery and strung out. It's great to have knowledge coming in, but if that information isn't retained, you're not helping yourself. Here are a few ways you can improve your memory and get more out of learning. Try speedreading. Save yourself time while studying by learning how to speedread. The practice will make you more efficient and can also help you to better absorb the material. How? Reading slowly can hinder your ability to take in new information (unless it's a technical subject) and speedreading also offers you the chance to filter out irrelevant information. Use mnemonic devices. Mnemonic devices, essentially tricks for remembering information, can make memorization much easier. Used right, you'll be able to remember all kinds of random information years down the road, just by creating acronyms and visual devices to go along with the material. Write it down. Writing down information you're trying to learn can actually help you remember it better than typing it out. The act of writing engages more regions of your brain than typing, though there is one caveat: your notes have to be of high quality for the practice to really help you learn. Rest your brain. To keep new information from trickling out of your brain you don't need to repeat it until your brain is exhausted. In fact, it's actually more effective to sit and rest your brain after learning something new; the practice gives a significant boost in memory. Use social media to organize information. Social media can be a great tool for organizing information and resources. Make use of sites like Pinterest and Evernote to track links, photos, and useful materials, or keep a log of your research on Twitter. Find like-minded learners. The Web makes it easier than ever to connect with others. If you're learning something new, reach out to others who are also learning, or who are experts on a topic, through Web forums. You may just learn a few valuable tricks or find some support if you're struggling. Don't listen to the naysayers. There are a lot of people out there who don't think technology is all that great for learning but they may be on the wrong side of history. Research shows that computer use actually gives students a bump in their grades, which while small isn't insignificant. Don't know? Look it up. The Internet offers you an amazing educational opportunity: unlimited access to knowledge. If you don't know something, just look it up. Take a MOOC. Massive Open Online Courses (or MOOCs) are a hot topic this year. They can allow you to take courses online for free from some of the world's leading academic institutions. It's an opportunity well worth taking advantage of for learners. Some things never change, including these tips that you can use to learn and study. No matter what you're learning or how you learn, you'll find help in relaxing, taking in new information, and making the most of your ideas. Loosen up. If you're stressed out or feeling tense, you're less likely to be able to learn well. So, take a minute to loosen up, have a laugh, and relax before you engage in learning. Get organized. You can make learning a whole lot easier by getting yourself organized. When you know where your materials are you'll waste less time looking for them and have more time for learning. Don't shy away from repetition. Repetition, as dull as it might sound, is actually a great tool for learning. So keep doing flashcards, studying notes, and practicing. Build problem-solving skills. It might not help you to remember small details, but building problem-solving and critical thinking skills is one of the best things you can do to improve your learning ability. You'll more easily be able to see connections, work through problems, and get more out of your studies. Understand that there is no wrong way to learn. There is no right or wrong way to learn, just what works. Cater to your own needs and forget what others say; that's the only right way to do things. Self-direct your learning. Research has shown that self-directed learning is one of the most effective ways to learn. Scientists aren't quite sure why that's the case, but while they figure it out you can use hands-on, self-led study to your advantage. Slow down and give your mind time to adapt to change. While humans are very adaptable creatures, we, and our brains, do need some time to adjust. When you experience a change of scenery, circumstances, or rules, give yourself a chance to let your brain catch up and get used to the new guidelines for learning before getting frustrated and giving up. You'll get there, it will just take time. Feeling frustrated with trying to learn something new? You're not alone. There are plenty of ways to get and keep yourself motivated, however, and you can read about a few of them here. Keep a learning journal. A learning journal can help to document what you're learning on a daily or weekly basis and can serve as an amazing motivator as you look back on all that you've accomplished. Give yourself credit. While it's good to push yourself, it's also critical to give yourself credit for a job well done. Let yourself bask in the glory of reaching your goals before you start moving onto setting others. Find intrinsic reasons to learn. Teachers, parents, and friends can offer motivation, but the best source of motivation is closer to home: it's you. Think about why you want to learn, not for others but for yourself. Set high but realistic goals. If you want to keep yourself motivated, set your goals and expectations for yourself high. If you don't, you won't have to work hard and you won't feel motivated to do the work. Keep a positive mindset. When you're struggling with a topic it can be hard to keep yourself looking at your progress in a positive manner, but if you get down on yourself you'll lose motivation and accomplishing your goals will just be harder. Create a learning-friendly environment. Do you have a space available to you that's conducive to learning? If you don't have somewhere that's quiet, organized, and private, work on constructing a space that will help, not hinder your learning. Set deadlines for yourself. Deadlines might stress you out a bit, but they're essential for keeping you motivated and working hard. Don't give up. Failure is how you learn, so don't throw in the towel just because you've had a few setbacks. Just like you didn't learn to ride a bike on the first try, learning new things takes time, so keep at it. Find a challenge. There are few feelings as amazing as rising to meet a challenge that's put in front of you. Set yourself up with a challenge and chip away at it bit by bit until you've met it. Looking to learn something new? From basic lessons to tech tools to teachers, you'll find some great advice on learning opportunities. Read everything. One of the most accessible and easiest ways to learn is by reading. Read everything you can get your hands on and you'll grow your knowledge by leaps and bounds. Let your learning branch out. If you're learning about one topic and find yourself interested in another, related topic that comes up, don't hesitate to take on learning more about that topic, too. It will enrich your knowledge about the original topic and encourage you to learn as much as possible. Figure out what you don't know. Not sure what you want to learn? Start out by figuring out where the gaps are in your knowledge. Once you know what you don't know, you can start working to fill in those gaps. Take a trip. Travel can be one of the most amazing and fun ways to learn. Take a trip to a place you've never been, whether close to home or far away, to learn more about history, culture, and geography. Make use of local museums and cultural centers. Most communities are full of learning opportunities if you know where to look. Use your local museums, cultural centers, and events as a way to learn more about things you've never explored before. Don't force it. If you're learning something just to learn something and you're finding yourself unmotivated to do the work, consider setting it aside for awhile. If you're not passionate about learning, you'll get less out of it and it may be better to wait until it's the right time for you to revisit a topic. Make a mindmap. Mindmaps can be a great way to organize your thoughts and figure out where you need to focus your studies. They're also a great tool for boosting creativity. Take notes. Taking notes, both in class and while you're reading, is a great way to help you condense and organize the information you're trying to learn. Have everything you need to learn. There's nothing more distracting than having to hunt for your notes or run out to the store in order to have all the things you require to do homework, complete a project, or even just learn from a class. Get everything you need first, then sit down so you'll be better focused and prepared. Collaborate with others. Working with others can help to spark new ideas, make learning more fun, and can even help you to understand topics you're struggling with. Just try not to have too much fun; you might forget to learn! Teach others. One of the best ways to really learn something is to teach it to someone else. You'll have to be able to answer a lot of questions about the topic, and it can be a great way to beef up your own knowledge, no matter the subject. Plan and prioritize your learning. You'll get more out of learning if you plan to make it an important part of your daily life. Set aside times for study and homework and make them a top priority on a regular basis. Test yourself. Research shows that there's a lot of value in testing yourself. Tests can both help you assess what you've learned and can help you to better learn and retain new information over the long term and apply it across different contexts.